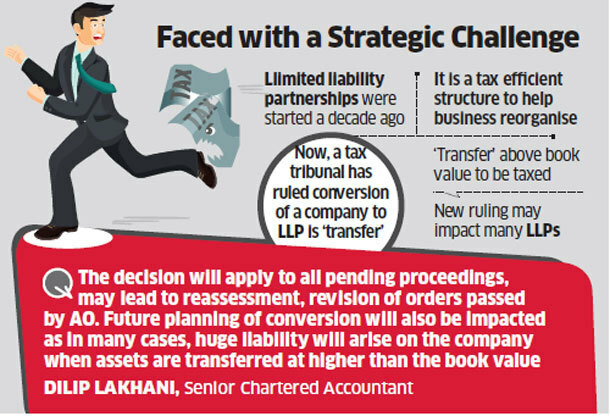 A new tax ruling of Converting company to LLP threatens to challenge a strategy that allowed thousands of businesses and professionals to reorganize themselves and attract foreign investors. There would be no capital gains tax, as per the tribunal, as long as such a transfer happened at book value. However, many businesses used to convert by valuing the assets higher than book value to strengthen the balance sheet of the LLP, borrow funds, attract foreign capital, as well as increase the net worth of the partners in the LLP. Smaller companies with less than Rs 60 lakh earnings are exempted from the definition of transfer (and thus, from capital gains tax). However, even companies with income above the threshold are currently in a position to avoid tax on the back of the Texspin verdict of the Bombay High Court, which said the conversion was not a transfer. The Income Tax Appellate Tribunal’s ruling on Celerity Power partly takes away that protection that companies enjoyed. Post ruling, the tax can be avoided only as long as ‘transfer’ from a company to an LLP happens at not higher than the book value. What is Advance Tax and how to calculate and pay Advance Tax?